Wow! This was some kind of a crazy day. I'm not sure exactly how it's possible, but it was at once mostly on schedule and also a complete scheduling disaster. We got a number of really good stories from today. I'm not completely sure that's a good thing. I haven't really been on a tour before where I felt like (on more than one occasion) I should include a picture of the landscape around the hotel. That includes the time in Boston when we were across from a Maserati dealership (still not sure why they didn't let me take a test drive). But here we were in Sedona, and the landscape was amazing. Even just outside the door. Special note about Sedona. They believe in roundabouts. They are everywhere. Other special note: roundabouts are not exactly tour bus friendly. Mad props to Mark for successfully negotiating them, though in all honesty it would not wind up being his most impressive feat of the day. You always have to have at least one picture of someone eating awkwardly and someone with their mouth full. After breakfast we headed out toward our first major destination. Because we were late getting in the night before, the mandatory 9 hour driver shutdown bit us a little, and we had to leave an hour late. Just in case you were wondering, it's not really possible to make a lot of time up when you're driving a coach bus, so that hour would be with us all day, which ultimately brought us to the biggest pickle of the trip. If only we had a little more time we could have headed over there for a snowball fight! As we were driving along, there were some fairly deep gorges to the right of the bus. When I saw them, I pointed them out to the youth and said, "Look how deep those are...just imagine how deep the Grand Canyon would look. It's a shame we don't have time to go there." Mind you, some of the youth have seen the leaked itinerary (regretful!). But a lot had not, and when we got the Grand Canyon park sign, I pointed it out. The bus was electric. The Canyon did not disappoint. I had never actually walked up to the edge of it (I flew over it in a small plain when I was younger). It really is awesome in the truest, non-valley sense of the word. 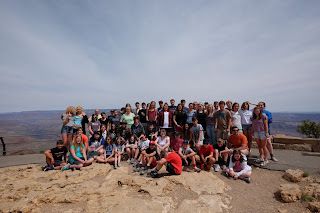 Honestly I was a little surprised at how excited the youth were to see the Canyon. It's just a big hole in the ground, after all. But they were excited indeed. Paul and Cindy were also excited. Paul is generally operating the camera for the group shots, so he's not in many of our pictures. He's also driving Chaperone 1, so I don't see him all that much. But he's always there and reliable. He and Cindy are stalwart chaperones and salt of the earth. Here's another group shot through Paul's camera. 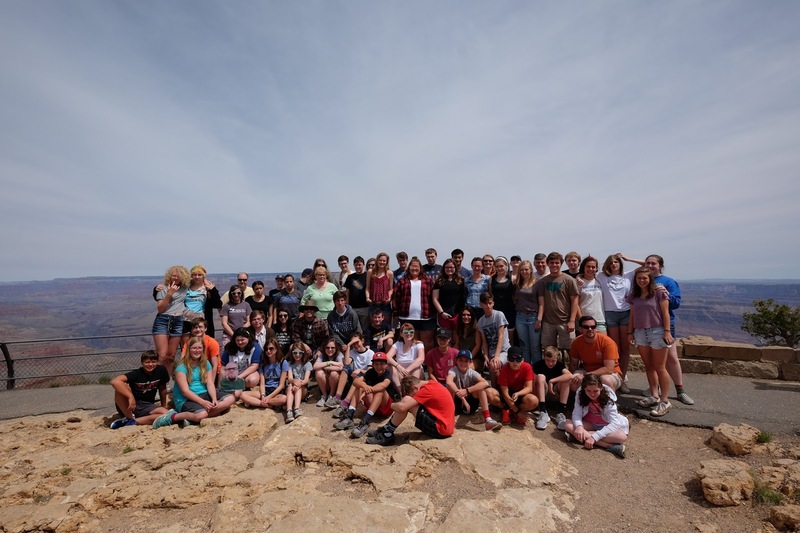 It's entirely possible that I will never be at the Grand Canyon with a youth choir again...I sure was proud to be here with this one. One final picture from the Grand Canyon. The music staff. It is an honor and a privilege to work with two people who are talented, caring, and generous in sharing their time and talent with our church. They are dedicated and supportive, and I couldn't do this without them. We headed from the Canyon down to the Hoover Dam. That's when things really got interesting. I had called some time back, and they said if we were there before the 3:45 tour we would be good. Just call and let them know we were coming. The bus GPS read ETA at 3:47. I called ahead, and the guy said, "You'd have to be here by 3:15 for the 3:45 tour. But if you get here before about 4:00 you can still get in the museum and observation deck." No problem. 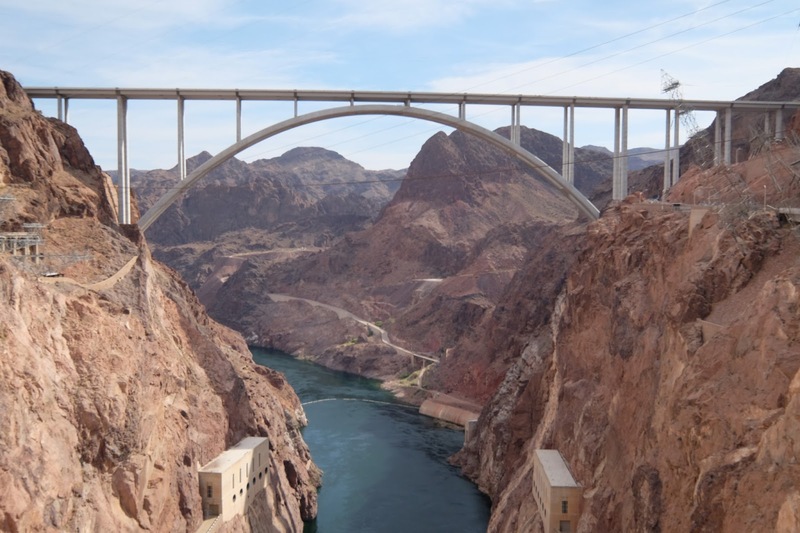 So we drive across the freeway bridge (pictured below) and head toward the dam. The dam police stop the bus to inspect it, and we open the door. (to driver) "Have you ever been here before?" Cop: "Do you have bags on here?" Cop: "Ok, this other officer will stop traffic so you can turn around. You can't go over the dam with luggage under the bus." That would have been good to know earlier, right? Like maybe if I had called to talk to someone about my group driving in from out of state? The cop pointed us to the Hoover Dam Lodge, just up the road. He said they sometimes will rent a room out and you can store your bags there. Mind you, we now have approximately 20 minutes to get ourselves back so we can get into the museum. We drove to the lodge. I went in, and literally every person working the desk was named John. They rented me a room. We removed literally every bag and box from under the bus, including all the driver equipment and tools. Ev-er-y-thing. When we got turned back toward the dam, it became clear that we would arrive at about 4:17. I called them back. Guy on phone: "Well, you won't make it before the visitor center is locked." Me: "Didn't you say it closes at 5?" Guy: "Yes, but they lock the door at 4:15." Me: "But we'll be there by 4:17." Guy: "That's right. So you can't get into the museum because it closes at 4:15. But you can still walk the dam and go in the gift shop. It closes at 5. Me (verbally): "Ok. Thank you very much." Me (on the inside: "ARE YOU KIDDING ME IF YOU HAD JUST TOLD ME ABOUT THE BAGS WE COULD HAVE BEEN THERE IN TIME IT'S LIKE YOU DON'T WANT ME TO BE ABLE TO GET MY KIDS IN THE VISITOR CENTER THIS IS THE LAMEST THING IN THE HISTORY OF THINGS BEING LAME." We've been on the bus...quite a bit by now. The youth are starting to show the signs of it. They created...a series of blanket forts. A whole complex of them. Two reasons for this picture. 1. A closeup of Mark's hat from the Winslow, AZ photo. 2. Dashboard Jesus. His grace has kept us safe thus far. I'm confident his grace will lead us home when the time is right. Also while on the road, I did a little music education class for the youth which consisted of me playing songs from my mp3 player over the sound system. In this picture, Anna is standing up and singing her heart out on Bon Jovi's Livin' on a Prayer. While I don't think they HATED my music per se, it's safe to say I haven't won any converts to the cause either. I'm a little sad about that. A little. Mark said, "AH! A BUS! It's headed right at us!!!" So as we were driving toward the dam, Cindy jumps up (almost injuring herself and others) to take a picture of..."A SWITCH YARD!!!" Cindy, your nerd is showing! This picture is us putting bags back on the bus after the dam. It took like 10 minutes. I was proud of the youth for kicking in and getting it done. OOOOOOOHHHHHHKKKKKKAAAAAAYYYYYY. Apparently I got my pictures all out of order. I'm sorry about that, but I don't currently have time to fix it. 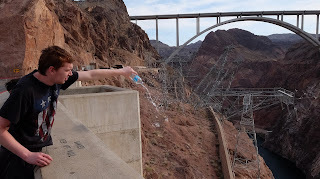 Here are some more dam pictures. Even with the dam baggage shenanigans, we managed to get to the hotel with 45 minutes before we needed to leave for senior dinner. So some folks changed and such. Cindy and Jill (Sarah) were both wearing awesome starwars rebels shirts. ...and Chris and Curt were dumb and dumber. Hey, if the shoe fits, amiright? Senior dinner was this whole other adventure. I walked into the place and greeted the hostess. I said, "I'm John Cowden with Decatur First UMC. I have a party of 59." She looked at me and blinked. "Do you have a reservation?" Yes I do. "You're not in the system here." Ok, well here is the email chain where we worked it out in April. I was working with Ashley. "Oh, Ok. Well, she's on leave right now. Let me get my manager." So they weren't ready for us. And then when they decided they could take us, they were going to give us a total of 4 salads and 9 pizzas (spoiler alert, that's not enough pizza for 59 people). All that said, the servers were great, the food was good. We had time to write a few post cards and of course to celebrate our seniors. Adrian, William, Kate, Bennett, and Steven. I sure am going to miss you guys. Thanks for all the memories. I can't sleep. I just can't shake the feeling that my sheets haven't been cleaned just for me, and I need a sticky note to tell me so. As much as I appreciate the mint, this card is not reassuring because it doesn't specifically mention the sheets and it wasn't stuck on the headboard. Please address this before our next night's stay. Thank you. And Thursday is done. 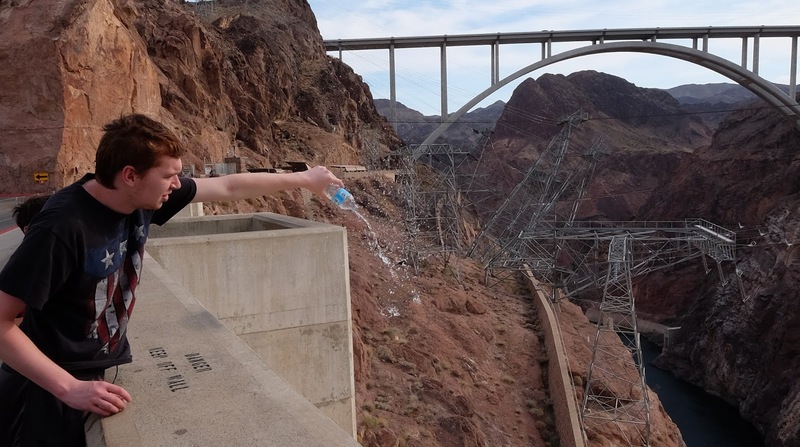 Our experience with the bags and Hoover Dam got me thinking. It's tempting to think that Embracing the Mystery is passive...be patient and let things happen as they will. But that misses a pretty important point. Embracing the mystery isn't passive. Sure, we let things happen as they might (like when you have to turn the bus around and find a room for your bags). But there are times when you find out which way you're supposed to go and then you apply everything you have. Ante up. Kick in. If embracing the mystery doesn't cost you something, you're probably not doing it right. Or, as Morpheus would say, "There's a difference between knowing the path and walking the path." Today we walked the path. I wonder what tomorrow will bring. Hi The Scott girls Grandma Linda here! WOW What a day! The kind that would disable a parent/ grownup with just a couple of kids! I think it was probably worth it, at the end of the day! This is Sarah Frost's grandmother. Love the pictures, thank you for making this experience so wonderful for the young people. May God bless you all and safe travels. I am enjoying reading the blog this week as much as the kids are enjoying the trip. If you ever leave the ministry (which I hope you won't), you should be a writer. 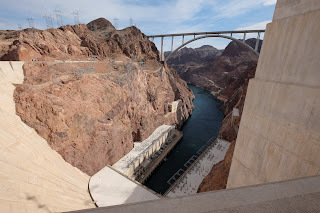 Especially loved all the dam pictures and the dam commentary of unloading all the dam suitcases to get to walk across the dam before the dam thing closed. If I'd been on the bus reading this, I would have been rolling in the dam aisle. I think your easy going attitude, flexibility, and humor has always been a great influence on these kids and it teaches them to be that way instead of stressing out about things. That is why you are so good at what you do and why they love you so much. Thanks for giving them such great memories. Thanks for allowing us to join you in spirit on your mystery tour John. I loved your dam blog.